WASHINGTON, Feb 11 2014 (IPS) - Thirty-five years ago today, millions of Iranians embraced a religious leader promising freedom from a corrupt monarchy and national independence. Now many want a better standard of living and improved civil rights. “Living standards are 50 percent higher today than they were before the revolution, but so are expectations, which is why the average person believes they had a better time before the revolution,” said Djavad Salehi-Isfahani, an economist who regularly visits Iran. After years of sanctions targeting Iran’s Central Bank and integral oil revenue, and government mismanagement of funds, the country is financially devastated, with a depleted budget and unemployment above 14 percent (25 percent for youth). “Early on, revolutionaries focused their attention on the provision of health, education, and infrastructure [electricity, clean water, and roads] for underprivileged areas,” the Virginia Tech professor told IPS. “These developments have helped move large sections of the poor into the middle class and a modern life style,” he said. Today, citizens from that expanding middle class and across Iranian society — now more educated than ever — desire better social and civil freedoms in addition to improved work opportunities. “The Iranian president [Hassan Rouhani] has released a citizen bill of rights and one positive thing he did is put this out there and ask for comments, but it really falls short on women’s rights and the rights of minorities,” said Sussan Tahmasebi, an Iranian women’s rights activist and the co-founder of the International Civil Society Action Network (ICAN), an NGO dedicated to women’s rights. 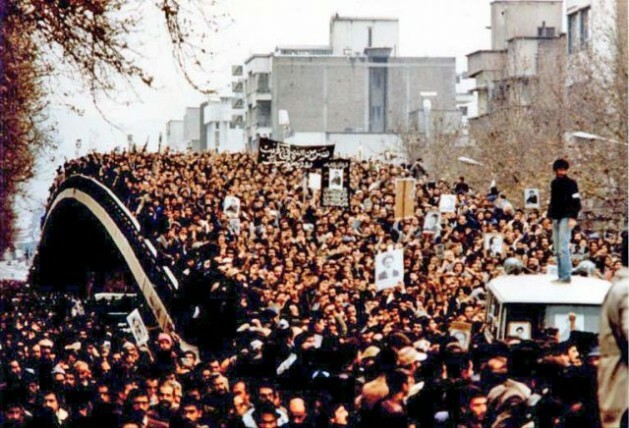 Demonstrations against the U.S.-backed Mohammad Reza Shah Pahlavi erupted in October 1977. By the end of the following year, strikes and protests had paralysed the country for months. The shah fled into exile on Jan. 16, 1979 and Ayatollah Ruhollah Khomeini was invited back to Iran, where he was greeted by several million supporters. On Feb. 11, guerrillas and rebel troops overwhelmed troops loyal to the Shah in armed street fighting, and Khomeini ascended to official power. Iranians voted by national referendum to become an Islamic Republic on Apr. 1, 1979, and to approve a new theocratic-republican constitution, whereby Khomeini became Supreme Leader of the country, in December 1979. Tahmasebi, who lived and worked in Iran from 1999-2010, also decried the continued imprisonment of student activists and reformist leaders, as well as Iran’s high rate of executions, which have increased in recent months. “Iranians want to live in an environment that’s safe, where the law is there to protect them rather than punish them,” she told IPS. Still, Tahmasebi acknowledges that the Rouhani government’s top agenda items are resolving the nuclear issue and improving Iran’s economy. “Once he has made serious progress at the international level, he will have more clout to push for more controversial issues at home,” she said. While Rouhani’s election would have been unlikely without the backing of reformist and centrist leaders, he must now maintain their support while also dealing with hardliners eager to regain their upper hand in politics. Iran is currently implementing the first-phase “Joint Plan of Action”, a deal achieved with world powers known as the P5+1 in Geneva on Nov. 24, 2013. Talks for a comprehensive solution to the nuclear issue are set to begin in Vienna on Feb. 18. Meanwhile, some of Iran’s most stalwart revolutionaries have raised the volume on their criticism of the Rouhani government’s handling of the nuclear issue. Members of the Revolutionary Guard, a powerful paramilitary unit, and several parliamentarians claim that Rouhani has given much more than Iran has received in negotiations. On Tuesday, anniversary commemoration rallies attended by millions in Tehran, according to state media, featured banners and posters responding to a Barack Obama administration mantra on Iran: “all options are on the table,” a reference to military force. “We are eager for all options on the table,” read some of the placards. Marchers also reportedly shouted an Iranian revolutionary mantra, “Death to America,” while others added, “Death to [Wendy] Sherman,” the U.S.’s lead negotiator and under secretary of state for political affairs. But despite domestic criticism, the Rouhani administration enjoys the support of Iran’s Supreme Leader, Ali Khamenei, who has repeatedly urged unity and faith in the government. “Considering the fact that it is only a few months [since] the administration has taken charge of the country, we should give executive officials time so that, by Allah’s favour, they can move things forward in a firm and powerful way,” said the Grand Ayatollah in a Feb. 9 speech to air force commanders posted on his website. “We should not allow the enemies’ agents inside the country to take advantage of weak points and to create disorder,” he added. Since last week, Iranian news outlets have been featuring stories on Iran’s military, showcasing comments by commanders stressing Iran’s preparedness to respond to military threats, and military weapons tests, such as the test-firing of domestically made missiles on Monday. In a speech celebrating the revolution on Tuesday morning to a rally at Tehran’s Freedom Square, Rouhani declared, “Today, if any side plans to launch aggression against Iran, it should know that the Iranian nation will stand against aggressors with its full might and make them sorry,” according to the Iranian Student News Agency. The president also emphasised Iran’s willingness to engage in “fair” and “constructive” talks on the nuclear issue. “Our negotiations with the P5+1 have all been based on Iranians’ peace-seeking nature,” he said. “We wanted to convey the Leader’s Fatwa [a religious decree against the creation of nuclear weapons] to the whole world during the negotiations and help them understand the Iranophobia project is a big lie,” stated Rouhani. “While negotiating with the world powers, we want to say sanctions against Iranians are cruel and inhuman,” he added. In Washington on Monday, a former hostage from Iran’s seizure of the U.S. embassy in Tehran, John Limbert, noted at the Wilson Center that some Iranian participants in that divisive event, “now older and wiser”, joined reformist administrations in Iran. “Both sides, after 34 years, have made a very startling discovery, that diplomacy — long-neglected tools of listening, of seeking small areas of agreement, of careful choice of words — can actually accomplish more than shouting insults, making threats and the wonderful self-satisfaction of always being right,” he said. This article is full of inaccuracies. I like to read Mr. Isfahani’s study and statistical analysis to find out how he arrived at the figure 50%. What statistical procedures and methodology he used? What were his base lines? What type of data he included in the study to quantify “living standards”. In order to do any comparative analysis, you must have internally consistent base lines. To arrive at a valid measure of performance, Ghajar dynasty’s standard of living indices should have been used to measure performances under the Shah and under Mullah’s regime. It’s very easy to lie with statistics: garbage in- garbage out.